Exclusive Interview with Fabrice Mathieu! Hey, thanks for taking time out to speak to me today! How are you? You’re welcome, I’m fine thank you! First things first, I thought that Dans L’ombre was a great short film and an inspired idea for filmmaking on a shoestring budget. How did you come up with the idea in the first place? Thank you very much for your kind words. We, my shadow and I, are very happy that you enjoy the short film! Before the idea came about I wanted to write a fantasy script and a story about us, the humans. One day, I saw a drama and suddenly I was interested not in the actors, but by their shadows! I began to imagine their lives and their feelings. At this moment I thought that I found exactly what I was looking for: a fantasy story about the humans through the eyes of their shadows! 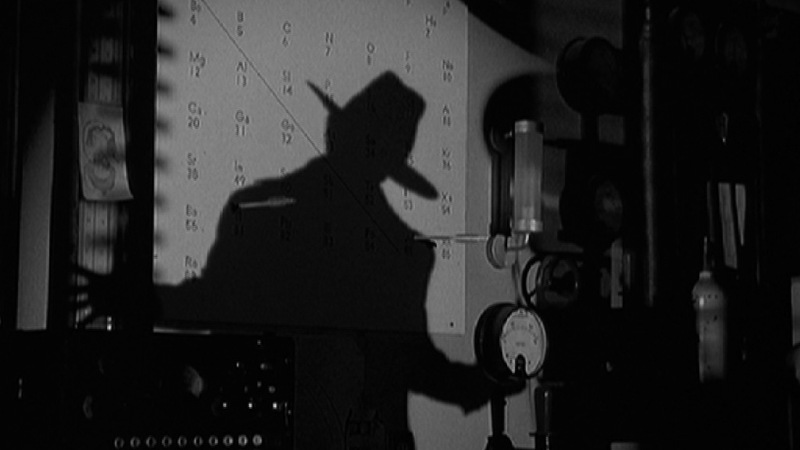 After writing the feature script of Dans l’ombre I realized that I had been in love with shadows for a long time! I was always fascinated by them in films. I love their power of subjectivity on screen, but also their aestheticism. They are magic and frightening sometimes. Was the idea of using old footage dictated by budget necessity? When I finished the feature script of Dans l’ombre I decided to send it to some people (friends and professionals) to receive their advice and feedback. Some of them were very intrigued and curious to see how it would look like on the screen and a producer recommended me to edit a kind of trailer composed of found footage. I had also had this idea in my head so I began to search for shadows in many films from Nosferatu to Sin City! I found lots of footage and instead of making a teaser to present all the characters I decided to tell the story of one silhouette in the script through a short film. More specifically its life with its ‘Wearer’, his flesh and bone double, who one day he decides to get rid of…. I found the story of this shadow perfect to use as a prequel to introduce the feature film. The decision to use old footage was also a budget necessity. If I had to film all you see on the screen it would cost already a lot of money! There’s certainly a delightful knowingness to the piece as we catch on to the many classic films which you use, to what degree was recognisable bits of footage, such as the machinery in Metropolis, carefully selected and placed within the film? It was really great to work with all of those masterpieces, but the most important for me was to share my story with the audience. So I did the best I could to edit the footage collected together from 56 different movies into one unique film. The entire new soundtrack and the voice over of the narrator Roger Candy helped me in this way. I was happy to see during some projections that people believed that it was a real film and not an editing project! But I think that cinema lovers are glad to see the film too, because they try to recognize most of the extracts and are interested to see how I have edited them together! And so how do you plan on making the feature film? Will it all be original material or shall it too draw from old films for footage? No I don’t plan to make the feature film with found footage. It was already very difficult to do the 8 minutes of the short film, it was a real puzzle! I made it like that just to promote the idea and the style of the feature. It was possible here with the voice of the narrator and post-production, but for the feature it’s impossible because there is a lot of dialogue, many characters and shadows and also their world to create. So I plan to put on the screen what I have in my head, but for that I need producers of course! And now onto a very different piece of work; what inspired you to use Marc Giai-Miniet’s work in your Mémoires Vives? It was when I discovered Marc Giai-Miniet’s work that I wanted to do a short film with the ‘Boxes’ he has made. It’s an incredible miniature world and I was very excited to film it as if it was a real world. I met Marc with the help of his nephew, Philippe Giai-Miniet. He’s an actor, and I proposed to him to play one of the silhouettes of Dans l’ombre. And when he read the script, he thought of the world created by his uncle. So through Dans l’ombre and the shadows I met Marc and his art! With Philippe we decided to make a short film with Marc’s ‘Boxes’. We wrote a first script simply to work on the story of Mémoires Vives. We thought that to tell the journey of a dead man into the Afterlife was a very good way to show all the important parts of the ‘Boxes’, like the docks, the mines, the lifts, the pipes… and the big libraries! Oh wow, that’s a pretty exciting way to meet Marc! How did you come to wanting to tell that particular story? What did you set out to say which hasn’t been said before when people discuss life after death? In this story, just like the others, I like to talk about the light and dark side of individual people. It’s not a new concept of course, but I tried to find an original way to talk about that, both visually and within the script, like the shadows or the lives of our souls after death. In Mémoires Vives we also talk about the memory of the people. I think it’s important to remember all the people who lived before us, to keep them alive in our minds after they died. So the book transformation in the film I think is a good way to show this idea. But we want to ask a question too with the movie: “What is the most important things to leave behind us after our visit on Earth? I hope it’s good things! For the afterlife of Mémoires Vives, I also find it interesting to imagine having hell, purgatory and heaven in the same place. And that each soul after death goes in these three worlds because we are all a mixture of lightness and darkness. I also like the idea of being kept all together in this big library of humanity, without differences of religion or colour. Working these complex ideas into such a story and unique set must have been difficult at times, what was the biggest challenge you faced across the whole production? Money! Of course it was important during the production but I wasn’t afraid since the beginning because I knew that it was possible to make this film with a very small budget but with the help of many friends.Really the biggest challenge was time because the film was already programmed for a big exposition near Paris of the ‘Boxes’ of Marc. So we had to work day and night at the end in order to be ready! And I have to ask… how did you come up with the design for the creatures we see in the film? The creatures we see in the film come directly from the pictures drawn by Marc. We try in this movie to be close to his art and the world he created. (Please have a look on his website to see his pictures and his ‘Boxes’: http://marc-giai-miniet.com/). We decided to make a costume of the creature and Philippe played all of them too! We added some special effects in post-production on the creature too. Finally, what can we expect to see from you in the future? I’m preparing another fantasy short film, and I’ll try to find a producer’s shadow for the feature of Dans l’ombre! Fantastic, thank you again for chatting with me today! I hope you all enjoyed this interview! Be sure to check out Fabrice’s work in the future and leave a comment below now! ← Exclusive Interview with Jessica Morris!